2018/12/18 - Updated rules §2.2, §2.4, §2.5, §3.3, §5.2, §5.4 and removed rule §2.7 "Car with trailer"
2018/10/17 - Removed the rule about translated replies, previously §4.9. 2018/10/12 - Updated rule §2.1, §2.5, §5.2 and removed the rule about using beacons in busy areas. 2018/09/21 - Updated rule §1.4, §1.5, §2.5, §3.2, §3.3, §3.4, §3.5 and removed the rule about local only mods. 2018/09/08 - Updated rule §1.3, §1.5, §1.7, §1.8, §5.8 and removed rule §4.10. 2018/06/29 - Updated rule §2.1 and §3.1. 2018/06/07 - Included brand guidelines in rule §5.5. 2018/04/02 - Major overhaul, many rules are rewritten and a section about save editing has been added. 2017/12/18 - Changed rule §4.2 regarding Ping kicks to include all types of system kicks - §4.2 Server Auto Kicks. Creating or using another account to get around a temporary or permanent ban. If the evidence points that you have ban evaded, Managers reserve the right to ban you again without notification. Using any of the report or communication systems provided on TruckersMP services inappropriately. This can include but is not limited to spamming them, reporting users multiple times with the same evidence and misusing the system for its intended purposes. Spamming forum/social posts or chat boxes with little to no content and/or useless content that adds nothing to a conversation is also classified as abuse. This can include but is not limited to the in-game chat, CB radio, horn spamming, our forum, support tickets, feedback tickets, appeals and reports. The evidence you provide us must be available for the length of the ban applied, plus one month. You can not report players with evidence that has not been recorded in-game by yourself. Blocking, Ramming and Wrong way reports should have video evidence. Screenshots do not usually show the full story or the extent of the issue. Insulting in the text chat should be reported with the full chat open. Reporting staff must be done through the feedback system. Spamming our report system with useless reports, reports using continuous freecam (Cam 0) to record or anything similar can lead to a ban from the report system. For some basic guidelines on reporting, please look at this forum post here. Using insults of any sort to put another user down. This can include but is not limited to racism, discrimination, discussing/expressing (extreme) political views, illegal or inappropriate situations. Light insults in chat such as "idiot" and "noob" are normally not punished, however, if abused they will be. Profanity without any insult is punishable. Bans or kicks are issued at our staff's discretion. Behaviour that is considered to be threatening towards any user of our service is not allowed. Impersonating other users, staff members, political figures, law enforcement, leaders and authorities of any kind or acting like someone who is more superior. This can be through the way you drive, use the voice chat, your avatar, your license/interior plates, username and/or your in-game tag. Avatars, usernames and in-game tags need to be appropriate and cannot contain offensive content in any way and are not exempted from light insults. Your name must consist of only alphanumeric characters or else it will be changed by staff without notification. Linking or providing access to unsafe websites or content. Any reference related to drugs, other illegal substances, pornographic or sexual content or otherwise illicit matters. This applies to any links posted, avatars, signatures, in-game tags, images uploaded or content written. Depending on the situation, this can also apply to other services that we use to aid us within TruckersMP. 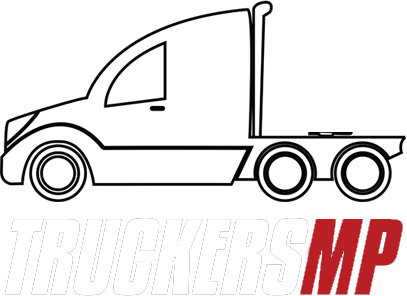 No violation of international laws or national laws that can apply to TruckersMP is allowed. It is the role of our moderation staff to seek out and identify offences on our platforms while they are managing the TruckersMP community. Do not take matters into your own hands. If you see something that breaks the rules, please report the post, topic or user on the appropriate system. You are not allowed to use our platforms to provide content that encourages, assists or otherwise allows other members to break TruckersMP's rules. If, for any reason, there are ambiguous terms in the rules, or terms which could be "open to interpretation", punishments may be issued as interpreted and agreed upon by TruckersMP Management. Any ambiguity falls on the side of TruckersMP, and not individual players. If an ambiguity is reported to us, we will work to remove the ambiguity. Loopholes are treated in the same way, exploiting loopholes will be punished for in the same way as the rule you are exploiting - you should report loopholes, not exploit them. Rules marked with an Asterisk (*) do not apply on servers with '[Freeroam]' in their title. Traffic laws and road signage must be obeyed. This means European road laws and signage must be followed in ETS2 and American road laws and signage must be followed in ATS. Failure to adhere to the respective road laws and signage could result in a ban. Using any kind of tool to change gameplay, including but not limited to using the in-game console, trainers or cheat engine in order to bypass the speeding limiter, to jump hack, no collision hack or anything similar. Misusing features such as the ghost mode to cause damage to others or similar. Causing a collision with another player intentionally or due to negligence. Attempting to cause a collision by steering towards their vehicle. Restricting a user's travel path, blocking entrances to highways or other entry points or anything similar. Driving the incorrect way down a road. Overtaking or undertaking another player in an area of extremely low FPS and/or in areas with large amounts of traffic, overtaking resulting in an accident or anything similar. This also includes overtaking on any one-lane in each direction road where there is excessive traffic such as a traffic jam. Areas with a large amount of traffic are considered to be 25+ players. Driving in such a way that is considered unsafe and that puts other people in danger, driving backwards, failing to yield, racing other users (except for the Arizona race track), ignoring other players and rules. Being outside of the map boundaries. This includes spots inaccessible by normal driving. Attempting to use desync lag or quick saves in order to cause damage to another user's vehicle is forbidden. Repeatedly driving to and from an area of high population with no aim other than to cause more traffic. Parking or stopping in areas of high population for no reason. This applies to areas with 25+ users. Using the designated car parks is fine when there is low traffic in the area. Convoy pilots are not permitted to slow down, block or control traffic, acting as a moderator and otherwise abusing the pilot scheme paint job. You are not permitted to take a convoy into highly populated area intentionally. This can include (but is not limited to) Calais, Duisburg, Calais-Duisburg road or surrounding areas. All rules apply to any event server unless approved temporary rules override for a certain event. Event server requirements can be found here. Temporary rules for events can be found here. The first 3 bans issued are at Game Moderator discretion. The 6th ban is permanent with no chance of undo. Any bans further than 12 months before the current ban are ignored under this rule. This is considered the cooling off period. If you have at least two history bans of the same length in your ban history, Game Moderators will extend your ban to the next ban history length, regardless of how many bans you have had in the last year. For example, if you have already had two 1-month bans, your next ban can be extended to 3 months. If you have two 3-month bans, your ban can be extended to perm. Note that bans that are extended due to it being your 4th, 5th or 6th ban cannot be removed, they are strictly 1 month, 3 months and permanent. Duplicate accessories (including addon hookups), or multiple accessories of the same type, except for bars mentioned above. Trailer combinations must only contain up to 3 cargo carrying trailers (dolly trailers do not count towards this). 3 full-size trailers are not allowed to be used in ETS2 due to the autokick system. Make sure that all mods you are using comply with these rules. You are responsible for all the modifications you decide to apply. If your modifications go against these rules you might face a punishment. If you are unsure whether your mod is allowed or not, ask staff members before going in-game. If a mod you use (regardless of origin) is found to be a cause of you losing control of your vehicle and collide with another player, you are liable to be banned for reckless driving. The forums follow a different warning and punishment system which can be found here. You may not post replies not relevant to the topic or previous posts on the topic. You can only post to bump a topic once every 3 days. In addition, you are not allowed to bump topics unnecessarily, for example, you are not allowed to bump your VTC topic unless the post adds content to the topic. Do not use titles such as "Help me" or "HELP" instead try to describe the content of the topic. If you for example have a problem related to lags, game issues or anything like that, try to use a title that kind of describes the problem. Example: Game lags? Use "Game lags" instead of "HELP". Do not use other accounts to upvote your own posts, "farming" likes or upvotes. Don't ask your friends to give you reputation whatsoever. If we deem and find out that you're farming reputation, then we reserve the right to reset your reputation to zero without any warning. You are not allowed to use this forum to trade/sell goods, Steam accounts or any other services (e.g. services which require subscription payment, TS3 servers, VPNs, PTC, Gambling sites and so on). This does not include official game store pages and free unused game keys. Max Height: 150px (Any height excess of 150px will be hidden automatically). Max Filesize: 150kb total download. Blinking or flashing GIFs as avatar or signature are not allowed. Moving GIFs or animations are allowed. A description of the intended purpose or use of a forum category can be found in the category description. Any topic that does not follow this can be moved, and even hidden or deleted. In case of users frequently posting in the wrong category, a verbal warning or even a warning point can be issued. Any category on the forum can have specific rules or requirements that only apply to that category. When this applies, information will be given in either the category description, above the category content or in a pinned topic in the category. Sub categories have the same category-specific rules and requirements as the parent category unless otherwise specified. For example, the ETS2MP bug reports category has the same rules as the general Bug report section. When a category has a specified format, using this format is required unless otherwise specified. Formats are given in the same way as category-specific rules. In a category with strict moderation, any off-topic posts will be given a warning point, without verbal warnings prior. This is to ensure the quality of the information found in certain sections. These sections are identified with a [STRICT MODERATION] tag in the section description. I'm banned. What do I do now? Ping - If your ping is over 600ms to the server, you will be disconnected from the server in order to avoid desync issues for others. This ping check is taken as an average. Away from keyboard - Being inactive for over 10 minutes. Double Trailers (ETS2) - Doubles are not allowed in Belgium, The Netherlands and the west side of Germany. For a map visualization click here. Car with trailer - Attaching a trailer to your car (not including the caravan) will cause the server to kick you. Headlights - Headlights must always be on between the hours of 19:00 (7 PM) - 07:00 (7 AM). Unsupported accessories - Using police accessories or any other unsupported items will cause the server to kick you. Too many trailers - Using a modified trailer combination with more than 3 parts for ETS2 or 5 parts for ATS will cause the server to kick you, regardless of location on the map. Staff reserve the right to kick or ban you from the Truckers MP servers at any point if needed. We ask you to create a ban appeal if you are banned instead of messaging any member of the team privately. The servers, mod and staff are provided free of charge for everyone and in that sense, everyone is a guest on the servers and it is a privilege that can be removed at any time. No form of persecution or offence toward any other members or staff team members will be permitted. We reserve the right to remove your right to access the servers at any time and at our discretion. Please note that the creators of the TruckersMP mod are not linked to SCS in any way, shape, or form. TruckersMP staff can be exempted from these rules if deemed necessary for their duties. If you have been banned, you have the right to appeal the ban at https://truckersmp.com/appeals. If you feel that your ban appeal is not handled correctly or that you want to file a complaint against a staff member, use our feedback system. You must have made a ban appeal and received a response prior to contacting feedback. Prior to contacting feedback, your ban appeal must be Accepted, Modified or Declined. This feedback system is your last option. Any decision made by high ranked staff members will be final and cannot be appealed in another way. Evidence for bans is required to be available for the duration of the ban plus 1 month. It is not possible to contact any member of the TruckersMP staff about bans that expired over a month ago. Our assets, including our logo, are copyrighted. You are allowed to use our logo accordingly to our brand guidelines. TruckersMP can change these rules at any time given. If one of those rules does not apply anymore, the others will still do. By using our mod, you agree to all of these rules. You have no excuse that you didn't know about them.